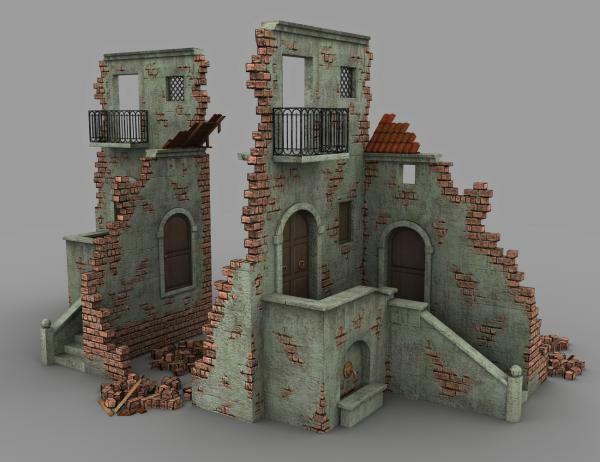 Ruins and rubble props. Ideally used as a facade prop in scenes. Doors and window open/close. 20 textures - diffuse + normals (768x768 to 4000x4000). Thanks & Enjoy! I can make boring, intact things, but takes real talent to 'distress' them so realistically. ankherman (3 years ago) Inappropriate? hypnagogia (3 years ago) Inappropriate? SimonJM (3 years ago) Inappropriate? Soulfire38 (3 years ago) Inappropriate? Really really great,like the other Ruins before.Thank you so much.I hope you will do a Ruined Store too.Keep that great work going! Excellent! I've been looking for something exactly like this, and this one along with your others looks really great! android65mar (3 years ago) Inappropriate? You're welcome. Thank you for your comments and ratings on this everyone. I'm happy to share it... and sorry its been a while since my last freebie. Hi, Hypnagogia. Rated the full compliment of stars, with thanks! Looks great from every angle. Fantastic modeling and texturing, again. You said you'd be doing more damaged buildings and this doesn't disappoint. Youve squeezed a lot of details for potential storytelling into this. foxpro (3 years ago) Inappropriate? Thank you for this wonderful model! I tend to be a pain int the neck critic who is never happy at anything, a nit-picker of the worst kind, but at least I'm honest. When I see something that I don't like or that looks ok but there's a fault, glaring or not, my compulsive honesty does not allow me to say it's ok because otherwise I'll be hurting somebody's feelings. Knowing that, it is my pleasure to more …I tend to be a pain int the neck critic who is never happy at anything, a nit-picker of the worst kind, but at least I'm honest. When I see something that I don't like or that looks ok but there's a fault, glaring or not, my compulsive honesty does not allow me to say it's ok because otherwise I'll be hurting somebody's feelings.